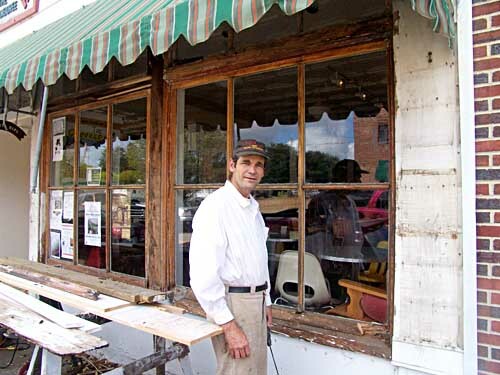 Craftsman Phil Woddail is restoring the original handcrafted windows of the Floyd Country Store to their former glory. Owner Woody Crenshaw wants to preserve the unique character of the Country Store and has spared no pains to see that the restoration is as true to the original design as possible,while meeting the needs of the 21st Century. When the process is complete, this century-old building will have a storefront appearance that matches the sparkle and enthusiasm of the Friday Night Jamboree. Woody also commissioned a redesign of the Floyd Country Store web site and that site is open today. Like the physical storefront, the online storefront gives visitors an invitation to come inside and celebrate. Click on the image to check out the new web site. You might want to bookmark it for future reference so you can easily check the Jamboree and special event schedules without having to call the store. Take note that Roni Stoneman will be performing at Floyd Country Store on Saturday, May 26, 2007 at 7 pm. This entry was posted in Seen around Floyd and tagged Floyd Country Store, Floyd Virginia, Friday Night Jamboree, Roni Stoneman, Woody Crenshaw. Bookmark the permalink.